Herm Island, set in the UK Channel Islands, is 3 miles from the coast of Guernsey and measures just a mile and a half long and half a mile wide. 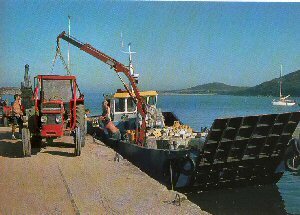 In the early 19th century, granite was hewn from the many quarries, and then hauled on its way to the shallow draught barges in the harbour. Much of this stone was used to construct St Peter Port harbour. The half tide harbour is safe in virtually all weathers. With its easy approach from St Peter Port, Guernsey, it is ideal for bilge keelers or multihulls. Visiting yachtsmen can moor using ground chains and buoys on the sandy beach or enter the inner harbour. Keelboats can lie against the harbour walls.